Well, maybe not the best thing. Maybe the best burger, though! Okay, definitely the best burger. But first things first. 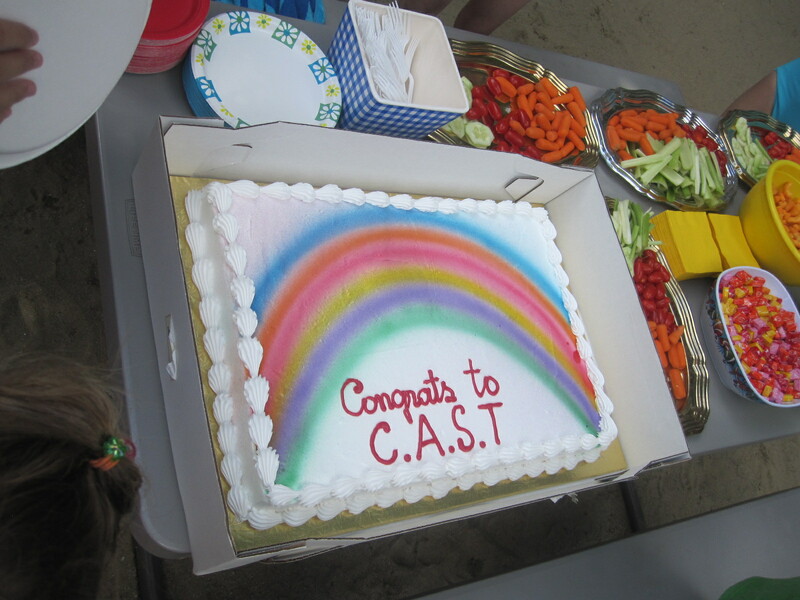 Saturday was closing night of my children’s theater production, and we had a party at a local swim club. I didn’t swim but stayed for the duration of the two-hour party and talked to the adults and laughed with some of the kids. I knew they’d be serving cheese pizza so I made sure to pack my own lunch (I wasn’t taking any chances with my tummy, I had places to go!). 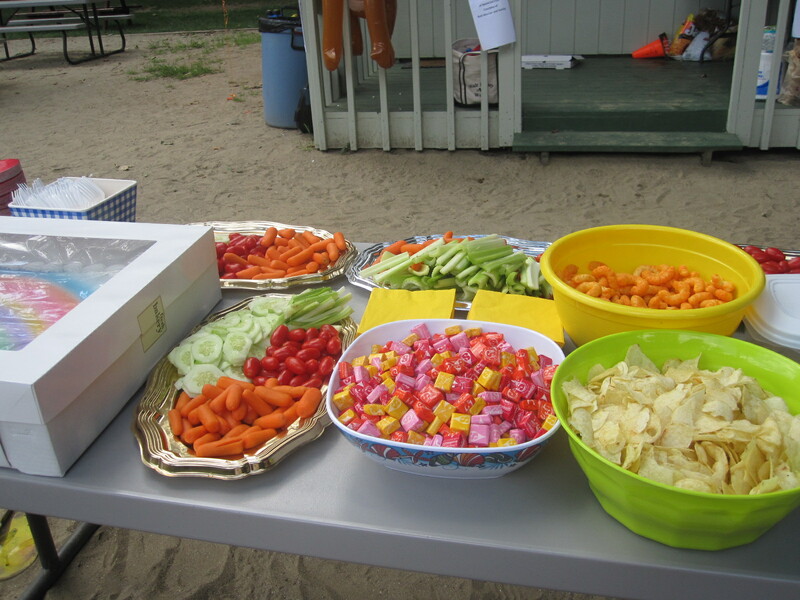 Thankfully there was an amazing fruit/veggie spread, so I snapped up quite a few munchies as well as my own packed meal! I put a huge dent in those baby carrots. 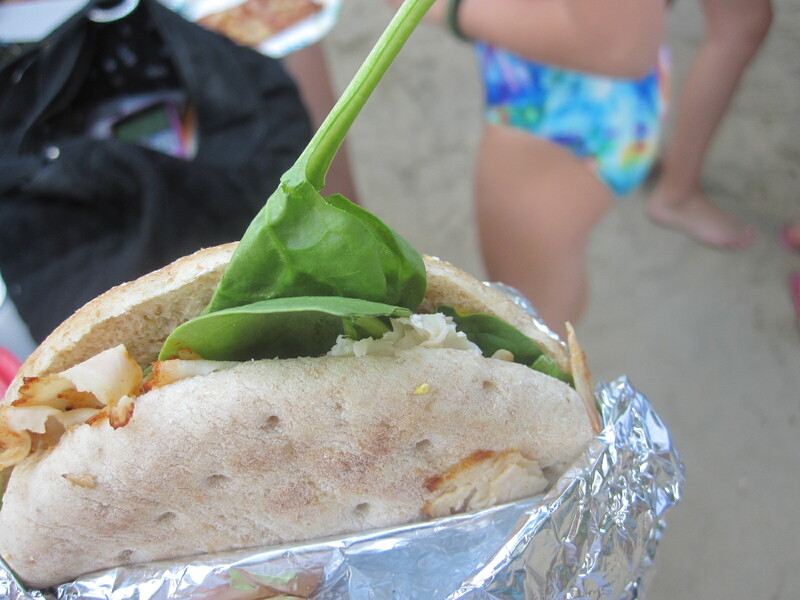 For my actual lunch, I packed a sandwich of deli buffalo chicken and spinach on an Arnold’s Whole Wheat Thin. 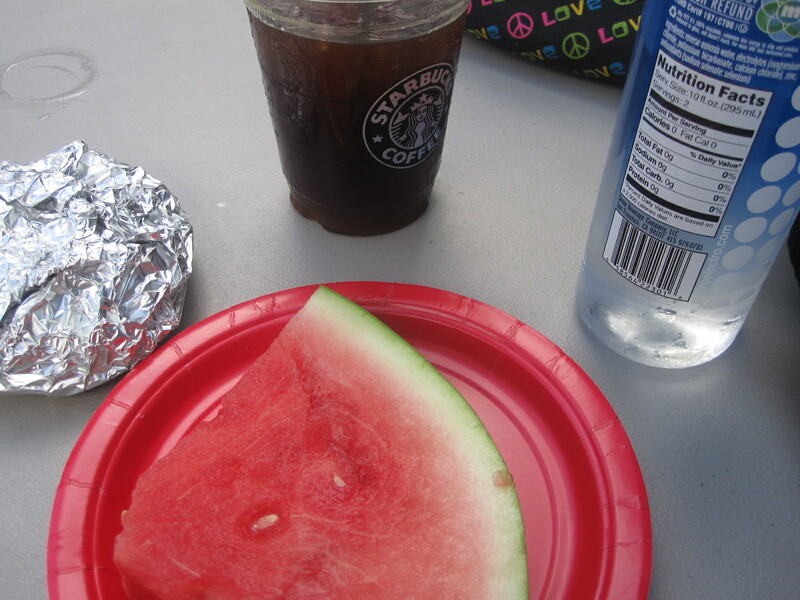 Along with two gigantic slices of watermelon and a decaf iced coffee. WAY too much fiber/fruit. I was in pain for the rest of the afternoon! It was so delicious though. I do regret it from the standpoint that after I finished my food, they brought out a giant sheet cake. can you tell what show we did? For my show dinner I packed a grilled chicken mixed-green salad, buffalo pretzel crackers, and a Weight Watchers Cherry Cheesecake Yogurt. 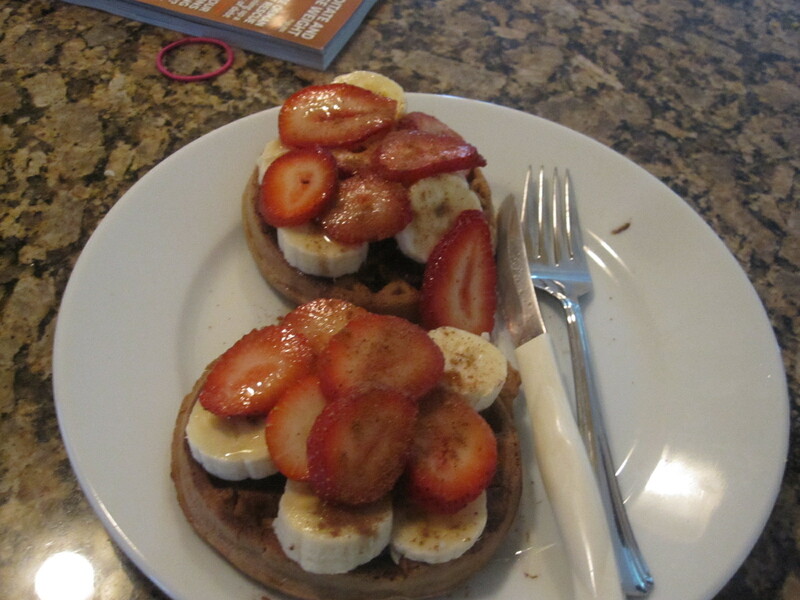 Yesterday for breakfast after my workout (20 minutes of abs and 38 minutes elliptical), I broke into my Van’s Lite Waffles and topped two with 1tbsp Maranatha Dark Chocolate Almond Butter, 1 sliced banana, 6 strawberries, and maple syrup. I should eat something like this after a workout more often. Not only was it delicious, but once it digested, it kept me full without making me feel stuffed for a good four hours. Once I got hungry, however, I was starving. Thankfully I had packed more than just a bar for work. I’ve realized that a combination of protein, fiber and fat along with carbs will keep me full longer. 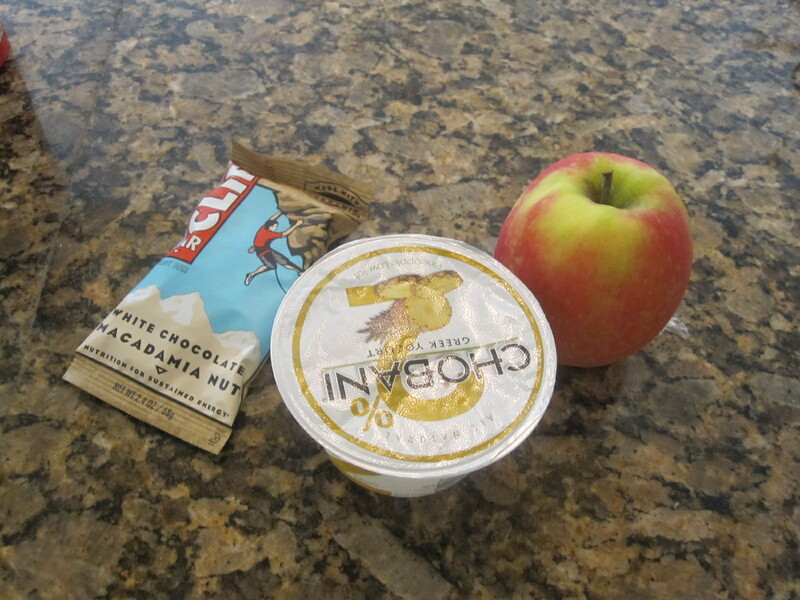 So I packed a Clif White Chocolate/Macadamia Nut Bar, a Pineapple Chobani, and a Fuji Apple. 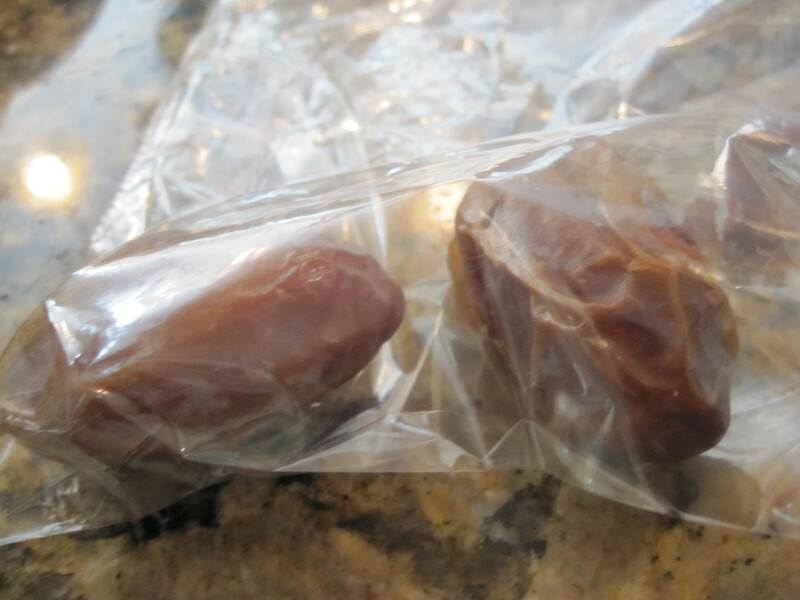 I also packed two dates for my mid-afternoon snack. I think this will be my go-to lunch for work. Filling, satisfying, and tasty, and things I can eat while on the run to mop up a floor, roll up napkins, or satisfy a customer request. Plus, it tasted AMAZING. It’s the first time I’ve had that particular Clif Bar, and I loved it. I plan to try the Luna version today. I actually got to eat sitting down yesterday, which I think really helped my digestion. Sitting down to a meal rather than standing up and eating makes you feel fuller longer, or so I’ve read! Then came the best part of my day. I met two of my best friends for dinner at Shady Glen Dairy, a local burger place that just happens to be famous! If you watch Food Network at all, you might be familiar with The Best Thing I Ever Ate. On the show, famous chefs and critics wax eloquently about the greatest food they’ve had. On the episode based on cheese dishes, one food critic (who hails from Manchester, CT) nominated the cheeseburger from Shady Glen Dairy! And you will see why. I used to eat these burgers every single week when I was a kid. And more than once! With fries. And a milkshake. AND ice cream! I managed to stick to just a cheeseburger this time, but I also got a side salad. I wanted a bit of health with my plate of coronary illness! And now you’ll see why people from around the country count this burger as one of the greatest they’ve ever had. Yeah. Your eyes are not deceived. The way they make it is pretty simple, actually. They layer four pieces of cheese onto the burger while it cooks on the grill, and allow the ends of the pieces to stick to the grill and cook right along with the meat. Then, the line cooks use a spatula to push the cheese up from the grill so it sticks up in UFO-like sculptures. Everyone has different ways to eat a Shady Glen burger. 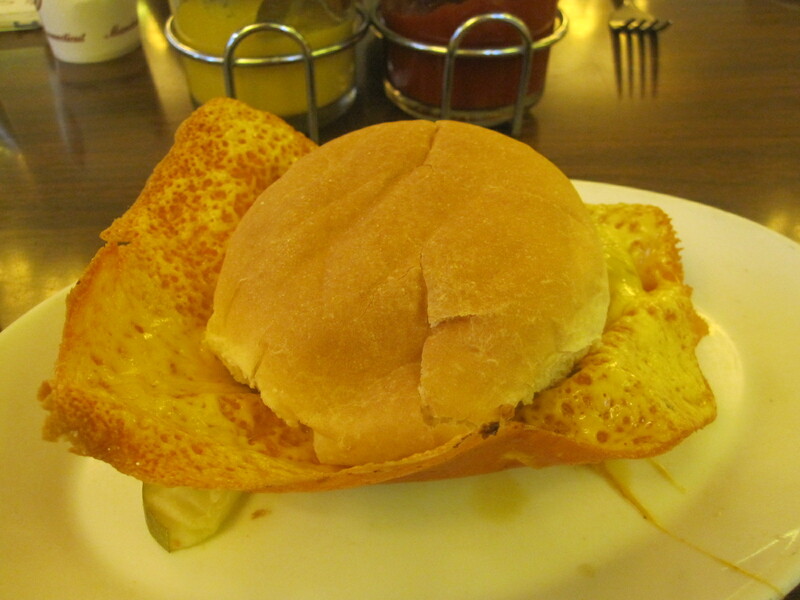 Some people fold the cheese on top of the meat, stick the bun back on and eat it all together. I pick off all of the cheese and eat it first (dipped in ketchup), then I slather the burger in condiments and eat that. My best friend picked off all the cheese as well, but then chose to alternate bites of cheese and burger, saving some chunks of cheese for last. The burger itself was cooked just right. Medium well, with a little bit of pink, and just enough juices. Absolutely delicious. I also stole some french fries from a friend’s plate, as well as a few sips of her Oreo milkshake, however I wasn’t a fan of that one. When we were kids, the milkshakes were chunky and full of flavor. This one was so watered down! It was the consistency of plain milk! But we knew the girl who served us was a new waitress, so we let her slide. I ended up not ordering some of their homemade ice cream because I had pushed it far enough with the cheese and the shake. 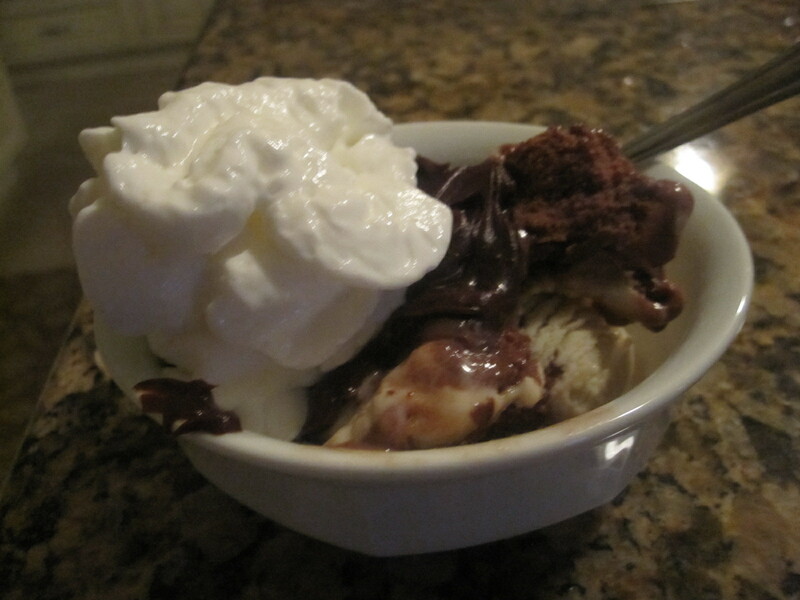 I went home and had some vegan chocolate peanut butter ice cream with a little spoonful of chocolate sauce and Reddi Whip Free. I was thrilled this morning to find that my stomach hadn’t had any issues with the cheese, however last night in bed I experienced a lot of rumbling. And surprisingly, I woke up starving. 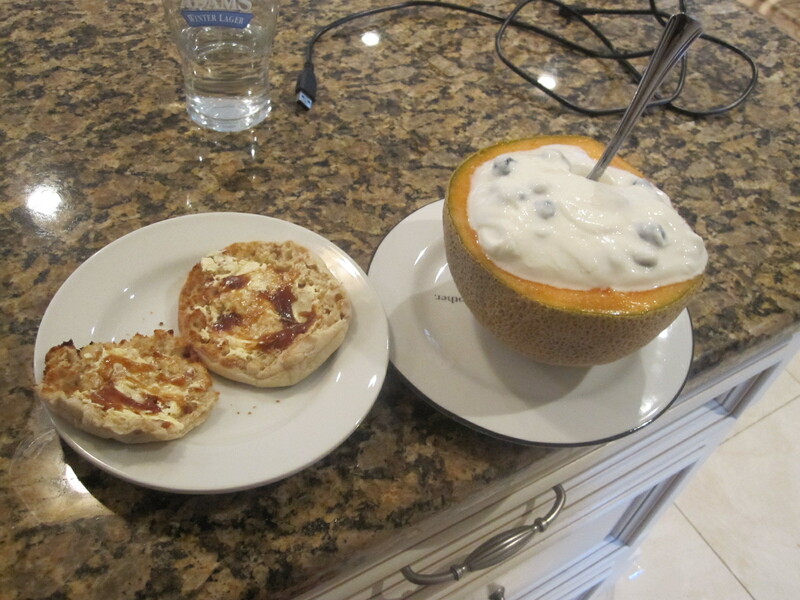 A good breakfast of fromage blanc, blueberries, 1/2 canteloupe, and a apple-cinnamon English Muffin with Smart Balance and apple butter helped to put a cork in me. Now I’m trying to figure out when I’ll go on my run, and probably will be running some errands. I finally have days off now in preparation for grad school in three weeks! I need to make the most of them!